Peach Chutney is a perfect chutney recipe to make when peaches are at their seasonal best. A tangy chunky relish, chutney is a perfect condiment for spicy Indian curries, for a Ploughman’s Lunch or as a side condiment for grilled meat. Quick to make and no canning required. Peaches, corn and tomatoes are in full swing, quite possibly at the peak of their perfection. It’s the perfect time to make seasonal recipes with summer produce. I’ve already seen pumpkin recipes on the internet. That feels a bit like seeing Halloween décor in stores in June. I just need a little bit more time to celebrate the summer produce. 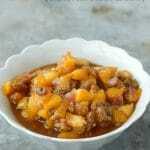 Chutney is a a spicy condiment made with fruits and/or vegetables, vinegar, spices, and sugar. It’s a sweet, tangy addition to spicy foods in particular and originated in India. I love a good chutney. The tanginess and depth of flavor and sweetness of the cooked fruit are soul food to me. If this is your first experience of a chutney, you may think of it like a relish. Chutney is wonderful over a curry dish, paired with meats or with a bold cheese and some crusty bread. 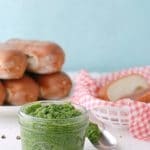 In the past I’ve made batches of chutney to can but I wanted to whip up a quick chutney recipe that could be eaten the same day. 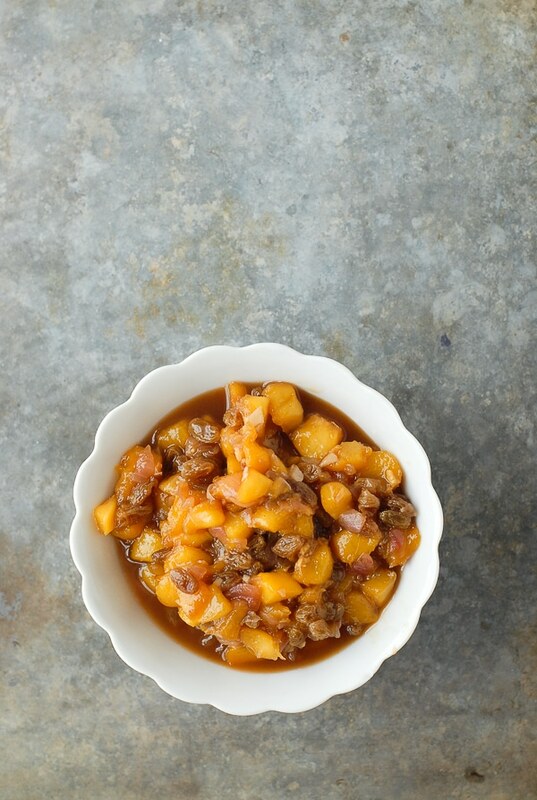 This Quick Fresh Peach Chutney recipe is a celebration of summer. Chutney’s are each changed up a bit by one’s traditions or preference though each has common elements of vinegar, fruit or vegetable, a sweetener of some kind and spices. It’s common to add chilies for heat however I wanted this chutney recipe to tame a specific spicy recipe so omitted those. 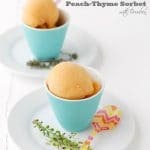 I love the fresher flavor of the peaches in this recipe, as did those in my household as it was gone lickety-split! 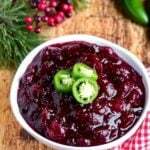 Some more seasonal chutney recipes to try include Strawberry Rhubarb Fennel Chutney, Persimmon and Cranberry Chutneyand Plum Chutney. 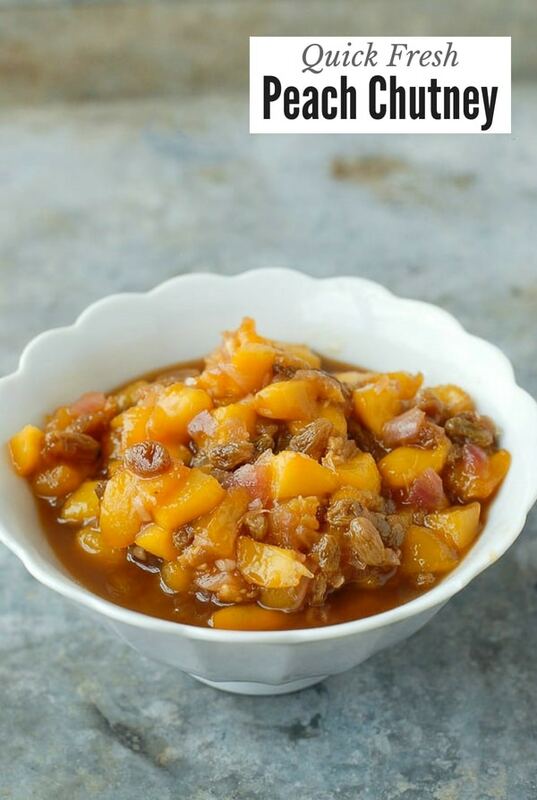 If you’ve tried this Peach Chutney recipe please RATE THE RECIPE below! Chutney is a wonderful addition to flavorful meats, curries and crusty bread and cheese. 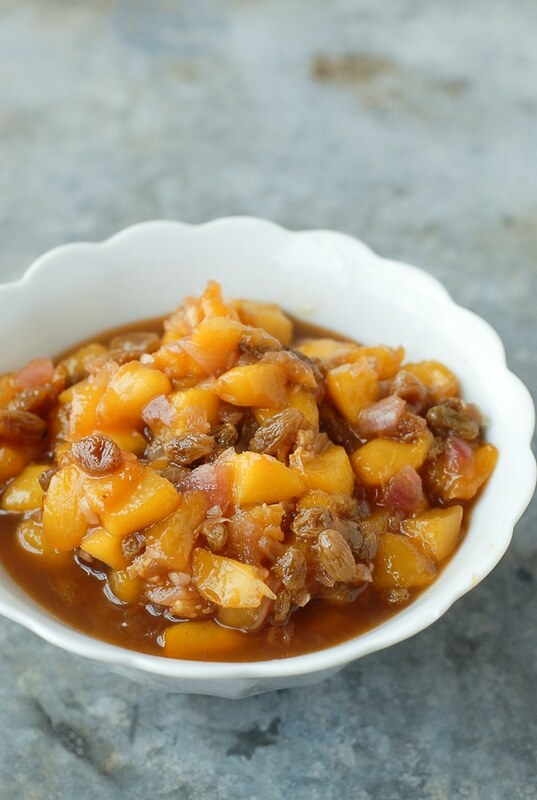 This Fresh Peach Chutney is whipped up in less than an hour , making it a great unexpected addition to any meal. Combine the vinegar and sugar in a medium saucepan over medium-high heat. Bring to a low boil while stirring to dissolve the sugar. Reduce to a simmer and add the onion, garlic, ginger, raisins, and salt. Simmer for 10 minutes stirring periodically. 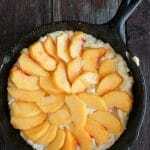 Add the peaches and simmer an additional 10 minutes or until peaches are cooked (firmer peaches will take longer). Remove from heat and allow to stand for 15 minutes before serving. Leftover chutney may be stored in the refrigerator in a sealed container for up to a week. Once refrigerated the chutney will become thicker. Yes, I would like to make a peach chutney to be canned. Could you can this one safely if you wanted to, and if not do you have the name of the one you used to can? Thank you. Hi Julie. The recipes I’ve used before were from canning recipe cookbooks. This recipe is designed as a fresh chutney so wasn’t developed to be canned. I’m sure there are many canning recipes available online if you would prefer to make a chutney recipe to can instead. I made this yesterday with mealy-flavorless peaches, and it turned out delicious!! I’m new to your blog, and it’s fantastic! I definitely need to try this! Looks really good! I can’t quit thinking of this dessert. I can’t believe how simple this is to make. Im a GA peach and I never had peach chutney before. I would be interested to try it out! oh my this looks so good. i need to make a dish tomorrow and this looks perfect. Sweet, tangy, and spicy… this is right up my alley! 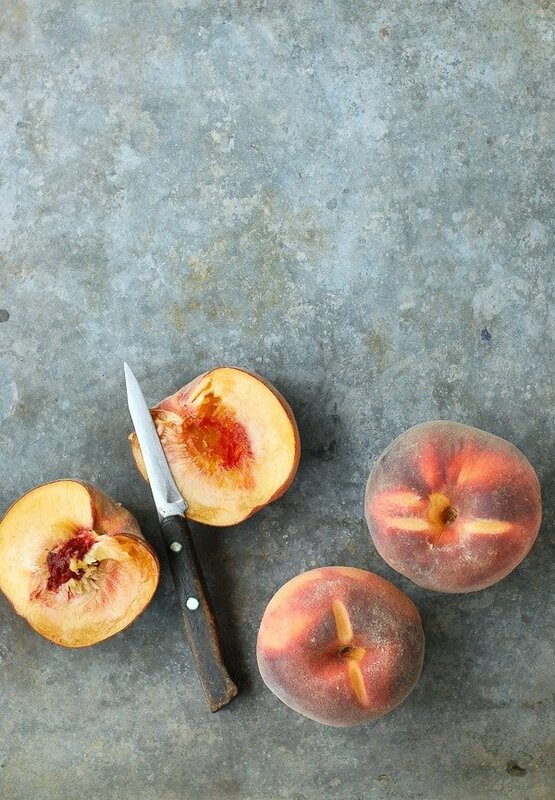 We just picked some delicious peaches that would be perfect to make this with! I have to try it!